So here’s a conundrum: I am a notoriously slow reader, yet I decided one day on a whim it would be a good idea to start reading The Agony & The Ecstasy by Irving Stone – a biographical novel of Michelangelo’s life. Friends, it took me a few months but it was well worth it… even if there were a few nights reading in bed that I woke up to quite a heavy book falling on my face. Those are the perils of reading a big book while exhausted… these perils are worth every sentence of The Agony & The Ecstasy. Let me say first that I aim to write about this (and other) books here not as a review, but to explore the effect of the book on the way I make art… and how it might affect you should you happen to pick it up and give it a read. What this book has me thinking about is what it takes to be such a staggeringly incredible artist that the world still worships your work over 500 years since your death. I mean… damn. It’s not even close to easy (hence the Agony portion of the title). The book is fraught with examples of unbearable anguish that Michelangelo chose to put himself through in order to make the absolute best artwork he could. The Sistine Chapel was more than years of painful head craning to make an utterly gorgeous painting. The way it all began? It was an order from the Pope, and Michelangelo had zero desire to paint it. He just wanted to sculpt marble. That was what his soul was begging him to do. But, the Pope is the Pope. So, Michelangelo hired a bunch of friends as assistants to paint the design he sketched out onto the ceiling. It was this lovely time full of laughter and friendship. 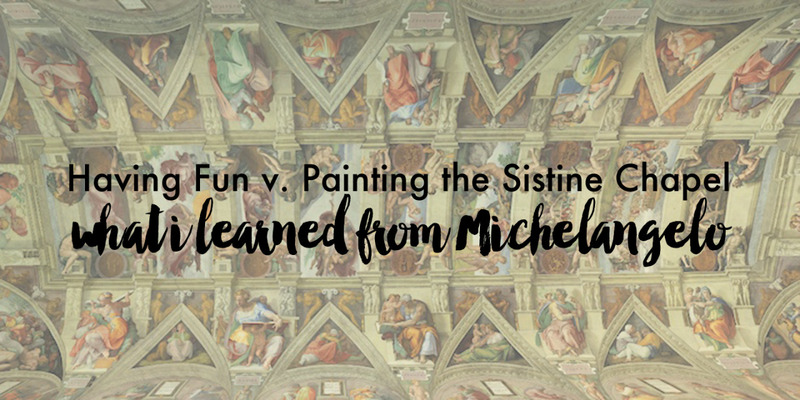 The friends spent their days together in the Sistine, working and laughing, and boarded at Michelangelo’s place at night. They ate, drank, and painted together. (I mean, seriously: can life GET any better than that?) But then everything changed. Michelangelo realized part way through, as he examined the ceiling, that it was just not superb work. He recognized that he could create something entirely different and gorgeous - but he would need to do it by himself. So he let his friends go, and painted over that first attempt… traded his days of laughing & friends for lonely hours up on the scaffolding, freezing cold and aching… and created a new world of artistic mastery. He figured out that world as he went, for four tormented years of his life, and created an incredible masterpiece that he felt in his soul was what he needed to do. What I, humble lil painter with a day job, take from this story is to always create something the best that I can. If a painting looks sub-par, and I know I can make it better, then go ahead and do it. Make it better. Spend as much time as needed to make it so the painting sings to my soul. I can think of past paintings I made that I thought, “eh. It’s done, I guess. I’ll move on to something else and check this one off my list.” … But in my deepest being I knew that painting was not done, and forever after that when I looked at it, it just didn’t satisfy. It might be easy to throw a piece in the “done” pile if I don’t know what to do next. But instead, I now sit with a painting, not knowing what to do, and just look at it. I keep it out while I work on other pieces. For perhaps weeks I won’t touch it. I’ll just be with it. My subconscious is aware it, and all the while that I am living and painting, it is magically figuring out what needs to be done. Then some day, the answer appears as a bolt of lightning. “ohhh! I need to tone down the background a bit and up the purples in the foreground!” And then I do it, and the painting has come to glorious life. In this way, we can all make our own private masterpieces. Our own little Sistine chapels.